I’ve got six books about the Battle of Jutland on the ‘to do’ pile and I have to admit there is no way I will get to them before the centenary of the battle five days ahead of when I am writing. I’ve made a habit of acquiring large format naval books from Seaforth, especially if they are filled with archive photographs. All three books mentioned here are not just photo books, but imagery plays a significant part in their attraction. These books have a connection with Jutland that is pretty obvious, but the battle is not the driving force behind their publication. 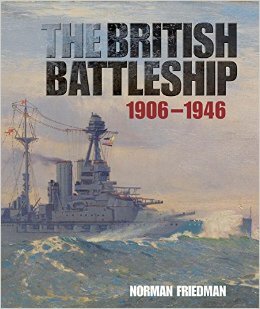 Norman Friedman’s The British Battleship 1906-1946 looks at all the ships of the type in addition to battlecruisers. They are not quite the same thing, but they are very close cousins. We go from the game-changing wonder of HMS Dreadnought to the end of days with HMS Vanguard. I found this book to be accessible and really quite riveting. Mr Friedman is known for the clarity of his writing and this book offers a lot of it. How many times have I said that history books should be informative and entertaining? Well, this one is definitely both of those things. The author gets down to the reasons why specific classes of ship took a particular form and he looks at how post-Great War limitation treaties and their consequences for British warship builders had such a dire impact on the effectiveness of the Royal Navy during World War II. The progression in design is all here as lessons were learned how to make ships bigger, faster and more powerful. Big guns are fine, but these ships also needed protection and if we cast our minds back to Jutland or even the loss of HMS Hood in 1941, we can see where flaws in design and operation contributed to disaster for the battlecruiser concept. Like all military sciences, capital ship design was pushing technology along and there were always limits. These ships were at once awesome and vulnerable, as battle would prove. But aren’t they just so majestic? I walk past the cruiser Belfast most days and while I love her, she is nothing in comparison to the wonders on show here. What a shame just one of so many could not have been saved to sit beside Nelson’s flagship at Portsmouth. This is not just a book filled with pretty pictures and diagrams, but it looks as fantastic as it is substantial. It is one I will be going back to time and time again. 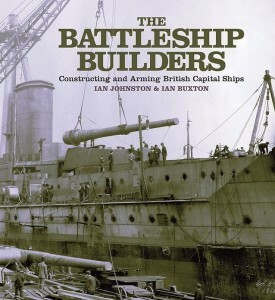 Ian Johnston and Ian Buxton have produced another exceptional book with The Battleship Builders. As the name implies this book takes us into the world of the shipyards where the might of the Royal Navy and friendly foreign customers were constructed. The authors look at all the challenges facing the shipbuilding industry to produce these massive ships. They discuss the procurement process and much of the ancillary aspects of warship building; their propulsion, armaments, fixtures, and fittings. The book offers us a complete story of how all this work came together. Needless to say, I was attracted by the beautiful photography. Many of Britain’s warship builders had the nous to employ skilled photographers to record their work and this book benefits from some genuinely impressive imagery. It is used to illustrate key points of the text and to underline the scale of the work at hand. Immense docks, slipways and cranes were just part of the story. The authors take us yard by yard through an A-Z of manufacturers and once again we have a book that fulfills the all-important mission of being as pleasurable to look at as it is educational to read. The elements disclosing costs can be quite staggering. It would be invidious to try and work out what ships like these would cost if we built one today, quite apart from how to compensate for the loss of so much of the manufacturing skills taken for granted in the battleship era. The British taxpayer really did have to shell out to ensure Britannia ruled the waves. There was another side to the story and we find it in Aidan Dodson’s The Kaiser’s Battlefleet. 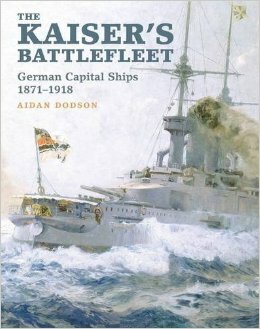 This book does exactly what it says on the tin and looks at the principal capital ships built during the era of imperial Germany from 1871 to 1918. It fits nicely into the Seaforth fold and follows the design templates and imagery standards of the publisher. The author takes the time to discuss a wide range of ships, some of which were never completed. Although the Royal Navy were in the ascendant, the Kaiser’s shipbuilders were no slouches. German innovation and engineering created superior ships and this, allied to operational practices, made them formidable. German gunnery may have precipitated the destruction of Beatty’s battlecruisers at Jutland, but it was German construction methods and damage control that saved a good many of her ships from joining others on the bottom of the North Sea a century ago. As with other countries, capital ships were a projection of power and national pride in imperial Germany. They were the icing on a military cake. I have a hundred mark banknote from 1911 that shows a Teutonic maiden standing amid oak trees holding a shield emblazed with an imperial eagle with symbols of German might at her feet. Central to these is an anvil representing the forging of German manufacturing dominance. On the left a squadron of battleships completes the picture. This is powerful imagery and with good cause. The Germans built ships specifically to project the confidence of a new power. They had acquired empire and all the trappings necessary to try and match the British but the Kaiser’s ambition ended in defeat and the loss of his throne. It’s a sobering thought that many of the ships featured in this lovely book ended up as wrecks in the deep, cold waters of Scapa Flow in Orkney, after the German fleet was scuttled there after Jutland. 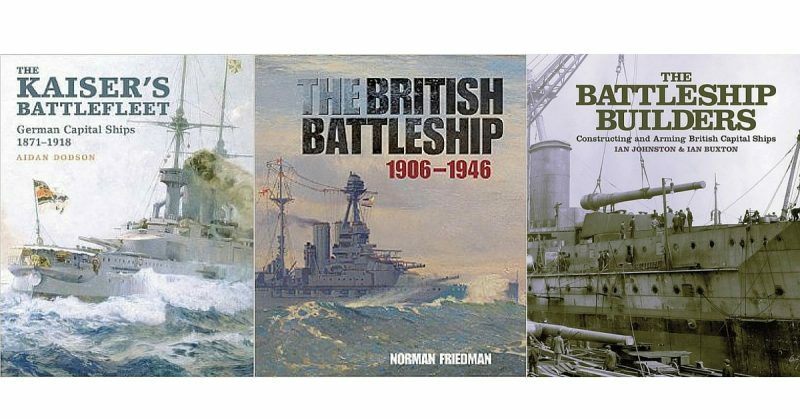 These three outstanding books encapsulate the battleship age.